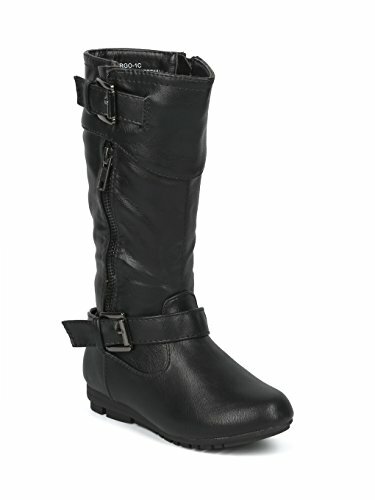 These super cute riding boots are made with a leatherette upper, round toe and stitch accents. Also made with buckle features and side zip for easy slip on and off. MEASUREMENT (tested sz 9; approx. ): Heel: 0.5", - True to size, brand new with original or Alrisco shoe box. THE PERFECT BOOTIES FOR RUNNING AROUND TOWN! : These versatile boots are perfect for when you and your little girl are on the go, going to school, or even having a play date! These riding boots are perfect with just about any winter outfit. Pair with a sweater and jeans or a cute dress! COMFORTABLE AND SECURE FIT: With the perfect amount of padding, you'll be able to run around all day with ease in comfort! WORRIED ABOUT OUR ENVIRONMENT? : We love animals as much as you do! No animals were hurt during the production of these boots. They are made with 100% vegan material and the rubber sole is from all man made materials. Our manufacturers are very environmentally conscious!